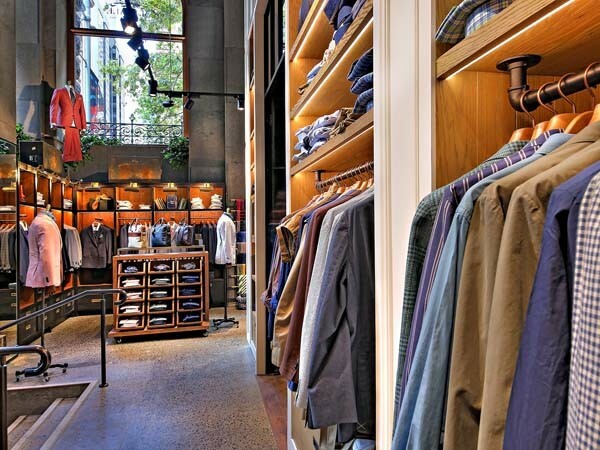 Aglo Systems supplied a stylish lighting solution for the Sydney CBD store of leading Australian menswear brand MJ Bale. Working alongside interior designers Edge Design Studio on the retail lighting solution for MJ Bale, Aglo Systems provided a stunning retail lighting solution to achieve a warm and inviting ambience in the store, with particular focus on the display shelves. Aglo’s Glacier recessed downlight was used in warm 3000K while Extro 14.4W LED Strip and Stealth Extrusion was used to highlight the shelving. Cast suspended track mounted spotlights were used in a combination of beam angles to provide both directional and background light in the higher 3.7m open ceiling area. The black fittings provided a striking contrast against the white ceiling.